Mesquit-O Madness, 'nuff said. 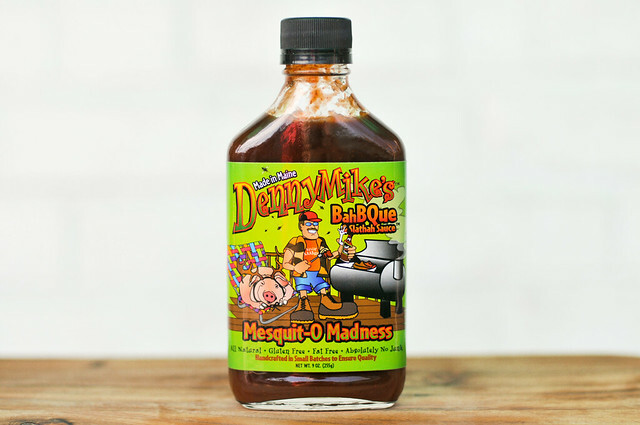 This sauce from DennyMike's is heavy-handed with the smoke, making it best paired with heartier meats like brisket or wild game. It cooks well on the grill, where the heat brings out some sweetness, mellowing the bite of smoke and lending a very robust flavor to anything it coats. Texas-style barbecue in Maine by way of Mexico, that's the story of DennyMike's. Dennis Michael Sherman, or DennyMike, found his love for barbecue while studying abroad in Mexico, where his Texan roommate permanently instilled the love for smoked meats on trips to Texas they took together. In the time that followed, DennyMike expanded his barbecue world-view while traveling from the Northeast to the Deep South and everywhere in between. In 2002 he brought his barbecue knowledge to Maine by opening up DennyMikes' Smokehouse BBQ and Deli. 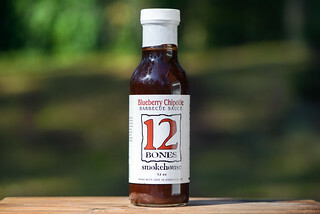 While the restaurant is currently closed during a search for a new location, DennyMike continues to sell his rubs and four different sauces online. This particular bottle came into my hands as gift from loyal Meatwave fans Clair and Bill. Mesquit-O Madness, 'nuff said. The sharp, strong smell of mesquite smoke masks most else, except some deep, sweet molasses that makes this one heavy sauce on nose. Heavy on the nose and heavy to the eyes, this thick sauce is the type that really clings to a spoon. It's a dark brown, opaque, and fairly smooth, with some visible spices that also create a little texture. 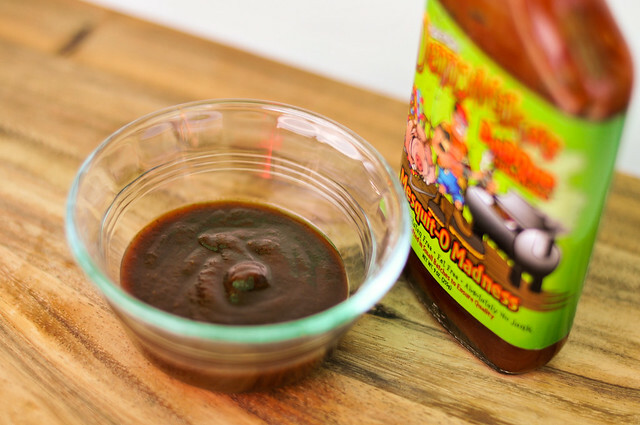 This a well layered sauce, with a sweet molasses to get things started. 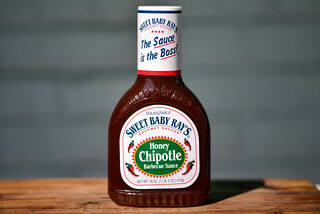 This then gives way to the flavor of the complex Worcestershire, some sweet tomato, and just a hint of honey. Only after the sauce has left the tongue does the mesquite really hit, but boy does it hit hard. Your left with a little heat at end, but a whole mouthful of a pungent mesquite smoke. 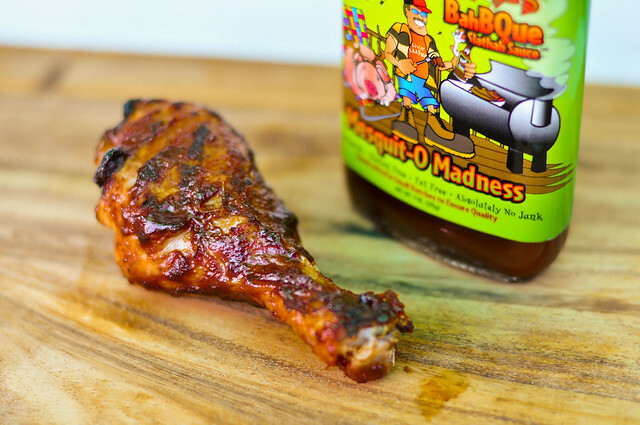 I'm not a big fan of smoke-heavy sauces, but find they usually find a better life after being grilled, and Mesquit-O Madness did just that. Beyond baking into to chicken very well, the smokiness came into a balance with the sweet notes that became more prominent after introduced to heat. Molasses was the clear provider of a robust sweetness, that played off the mesquite quite well. As I mentioned, I'm not hot on smoke sauces, and this is a heavily smoky sauce. It will quickly overpower any more delicate items, so it's best used on heartier meats like a beef brisket. The bottle recommends its pairing with wild game, not being a wild game eater, I can't back that up in certain terms, but it seems about right. 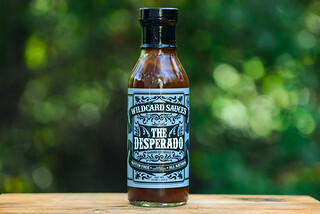 Like most smoky sauces, this one mellowed and balanced better after cooked, lending a very robust flavor to the chicken that it adorned, and I personally enjoyed it much better this way.